Steve Bruce has left Birmingham City to become Wigan boss for the second time. Latics chairman Dave Whelan confirmed the three-year contract on Monday, with Premier League rivals Birmingham City yet to release a statement. 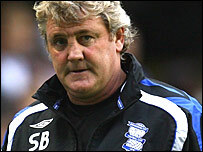 Wigan will pay £3m in compensation to Birmingham, and Bruce will reportedly earn £2m a year with his new side. "You would think nothing of paying £3m for a player," Whelan told BBC Radio 5 Live. "To have a manager of his quality it's a very, very cheap price to pay." Bruce, who had a brief spell in charge of Wigan in 2001, succeeds Chris Hutchings, who was sacked at the start of November after 12 games in charge. Hutchings told BBC Radio Five Live on Tuesday: "People at the club already know Steve. He's got a good track record of getting clubs up and this year's going to be big test for him. "He's got a good squad of players. He would assessed the two squads and may have thought that Wigan's squad was stronger than Birmingham's," added Hutchings. Last week, former Wigan boss Paul Jewell told the BBC he had rejected an "unbelievable" offer to return to the club. "Straight away when Paul Jewell decided he wasn't going to come back to Wigan, Steve was the man we wanted," Whelan told 5 Live. "He's a very, very talented young manager. He worked with me for six or seven weeks about five years ago. "I wanted to keep him then but his wife wanted to live in London and he moved on to Crystal Palace." Bruce was Birmingham manager for nearly six years but could have been out of a job in January if Hong Kong businessman Carson Yeung's proposed takeover of City goes through. The 46-year-old held what were described as "positive talks" with Yeung a fortnight ago after the 3-2 home win against Wigan. But uncertainty remained over whether he had a long-term future at City once Yeung's expected takeover takes place. BBC Radio 5 Live's Pat Murphy said: "They don't know whether Yeung is going to take over the club. "Bruce feels a little bit out on the periphery, he's not getting as much support as he would like. "He just feels he's got more chance of solidity and he can kick on and do himself justice as a football manager, rather than a firefighter, if he goes to Wigan." Whelan is also keen to recruit Eric Black, Bruce's assistant at Birmingham. Jewell left Wigan in the summer, saying he needed a break from football, and his assistant Hutchings stepped up to replace him but was fired with the team at the foot of the table. They are 19th in the Premier League, with two league wins in 13 games, and are away at leaders Arsenal on Saturday. "He may as well come in at the deep end and get stuck into the Gunners," said Whelan. "Steve Bruce will make Wigan Athletic a fighting machine again, that's what we've been lacking."